7 Bedroom Detached House For Sale in South Croydon for Offers in excess of £1,000,000. 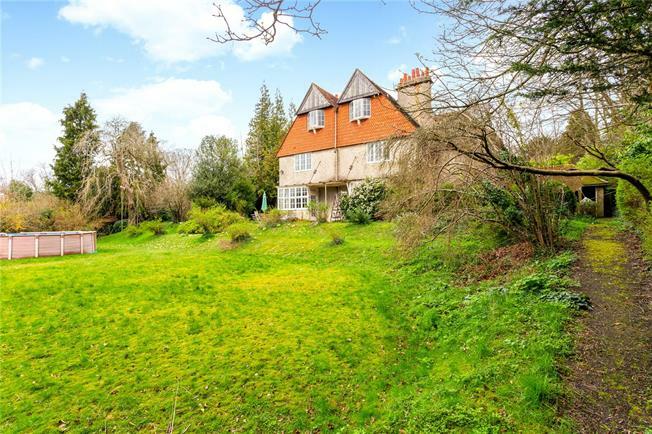 A rare opportunity to acquire a substantial historic property in the desirable Sanderstead residential area of Hook Hill. The property was built in 1907 for the Tillings family and has remained in the same ownership for over a 100 years. The detached property retains a wealth of period features from this time, including original floors, doors, bay windows and sinks throughout. Though the architect is unknown the style is reminiscent of the domestic revival architecture made famous by followers of Norman Shaw, and as such the property was Grade II listed in 2004 to reflect its architectural significance. The accommodation is arranged over three floors with rooms of excellent proportions throughout, though the interiors require significant modernisation. The property is entered through an enclosed porch and into an entrance hallway with a fine original staircase with heart detailing rising to the bedrooms on the first floor. There are three reception rooms including a drawing room with open fire and oak fireplace, a sitting room with stunning oak glass fronted cabinets and a separate dining room. The Drawing room and Dining room have opening sliding doors to enable one large room, ideal for entertaining. The kitchen is also of a good size with space for a breakfast table and there are additional storage rooms adjacent including an original housemaids Pantry with glass & wood panelled doors, maids sink and original slate shelving for baking. The bedrooms are arranged over the first and second floors, the latter originally designed for staff in the building’s early years. The seven double bedrooms are all of a good size and feature high ceilings, large windows and further examples of the building’s exceptional character including fireplaces. There is a bathroom on each of the upper floors, one featuring a fantastic claw-footed rolltop bath. Hook Hill is situated in the heart of Sanderstead just off The Ridge Way, within close proximity to two train stations and an excellent choice of schools in both the private and state sector including Whitgift, Trinity and Croham Hurst. Local walks can be found in The Beeches and Wettern Gardens, and there are a number of tennis courts, cricket greens and golf courts locally. Sanderstead also has local shops and a Waitrose supermarket. The M25 is approximately 20 minutes with access to the motorway network and Gatwick. TRAIN SERVICES: Sanderstead is 1 mile and has direct services to London Bridge (24 mins) and Victoria (26 mins). Purley Oaks is 0.8 miles also with direct services to London Bridge and Victoria. There is also a tram station at Coombe Lane with services to Croydon and Wimbledon.